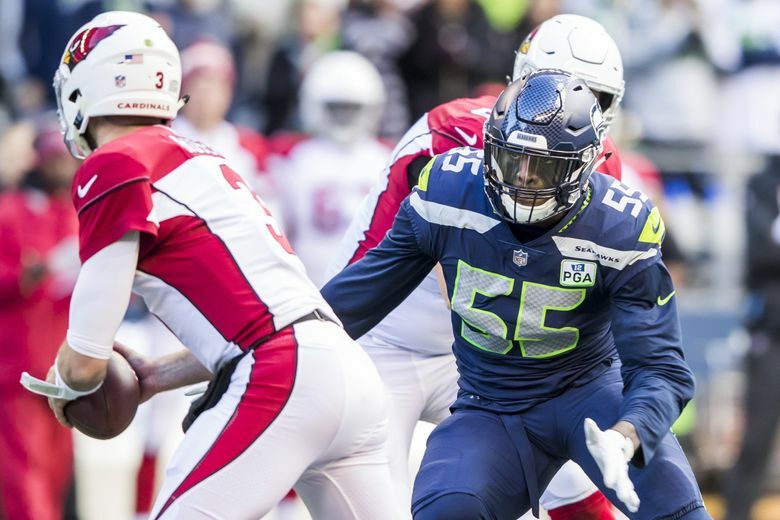 Seahawks pass rusher Frank Clark had a career-high 14 sacks in 2018, and apparently, he accomplished that despite injuries to both his elbows that persisted throughout the season. After the fact, NFL players often become freer talking about the extent of the injuries they played through in any given game or season. So it is with Seahawks defensive end Frank Clark, who took to Twitter on Tuesday night to say,”I wouldn’t lie to you guys. I played the whole season at 60%” and then later tweeted that his specific injury involved his elbows. That’s an apparent reference to Seattle’s 21-7 over Minnesota in a Monday night game on Dec. 10. The UCL is the Ulnar Collateral Ligament on the inside part of the elbow. It was known Clark had elbow injuries — Clark was listed on the injury report for each of the three remaining regular season games following the Minnesota game — and coach Pete Carroll at one point referred to Clark as having “hyperexteded” his elbow. But Clark shrugged off the impact of the injuries at the time. Clark was also listed on the injury report in Week 2 with an elbow injury (it’s unclear if that’s related to the injuries he says he suffered against Minnesota though Carroll also referred to this as a hyperextension that he said happened in the preseason) and then famously battled food poisoning before an October game against the Rams. Clark also spent last offseason recovering from broken bones in each hand, one of which required surgery. Was Clark, who can be an unrestricted free agent when the new league year begins March 13, using Twitter as a tool to let Seattle know what it might be missing without him? That’s hard to know. But Clark’s revelation comes at an interesting time — he has been in talks with the Seahawks since the end of the season on a new contract. Seattle could place a franchise tag on Clark beginning on Feb. 19, a period that goes through March 5, which would mean that if Clark signs the tag he would play for Seattle next year on a one-year guaranteed contract likely worth more than $17 million (tag figures have not been set yet). Seattle has not used the tag since 2010 (on kicker Olindo Mare) but sources have indicated it’s a legitimate option for Seattle in regard to Clark, who led the Seahawks with a career-high 14 sacks this season, the most for any Seattle player since Patrick Kerney had 14.5 in 2007. A second-round pick in 2015, Clark already is 10th on the team’s all-time sack list with 36, and his 33 in the last three seasons is tied for the seventh-most in the NFL (one behind the 37 of Khalil Mack — Chandler Jones of Arizona has the most in that time with 41). Despite the ailments, Clark started and played in all 17 games this season and he has not missed a game in the last two seasons and only two in his career, his production and consistency among the reasons Seattle coach Pete Carroll said at the end of the season that the team would not let Clark get away. “I’m counting on it (Clark being with Seattle in 2019),” Carroll said then. “Counting on it. We’ve got a lot of work to do. … There’s a lot of stuff that has to take place, there’s a lot of business. John (Schneider) has a master plan of carrying this thing out. He’s got a schedule and calendar of all kinds of stuff that he’s working. … There’s a strategy and a plan to carry this out and our guys know.